2018 has started as really good year for me and my family. There is this notion of everything being or falling into right place, not at exact time as planed but still on its right place. Kids are bright and healthy, my wife is doing projects of great importance and there have been some positive changes and happenings in Sarajevo. It is far from perfect, but perfection is not the goal, perfection brings dullness and there should always be a few drops of chaos to create life. One of this events was a performance by DJ Krush, my favorite trip hop DJ. First and last time I saw him was in Zagreb in 2007. His performance here in Sarajevo meant so much to me, it brought me some sense of stability, almost hope for prosperity and for this feeling I have to give my thanks and praises to Art Lab and Sarajevo Intergalactic Session 2018. He went out of his Cosmic Yard promotion tour set and treated us with slices of tunes from his rich production as some intergalactic master sushi chef. We were blasted with trip hop and hip hop beats, ambient landscapes, flat techno and strictly turntablism. 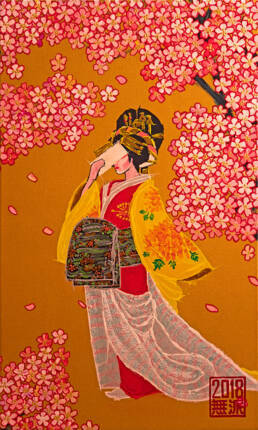 In the meantime I got commissioned by a VIP from Zagreb, Croatia, to do 2 paintings in my Japanesque style. 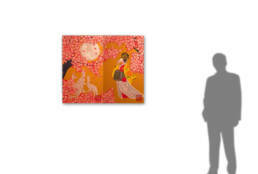 As we talked I proposed a painting, diptych, where each panel can stand alone as a single painting. As I tend to give a name of my favorite songs to the painting, in this case I gave the name to the diptych name KiOku – 記憶 or Memory as a tribute to DJ Krush and Toshinori Kondo´s album of the same name. This deep trip hop jazz album evokes memories of Tokyo in me in some lonely noir fashion. When I hear their cover of Marley´s Sun is Shining I have unbearable nostalgia, one that causes me to feel that in the next corner street I will be greeted by the line of wending machines. As I am working on my new series of paintings, entitled “Heaven’s Gonna Burn Your Eyes”, where I am dealing with my memories of Tokyo, there are lots of emotional states, fragments of imagination, confirmed unbelievable moments that happened (through video or photography) that will not be included. 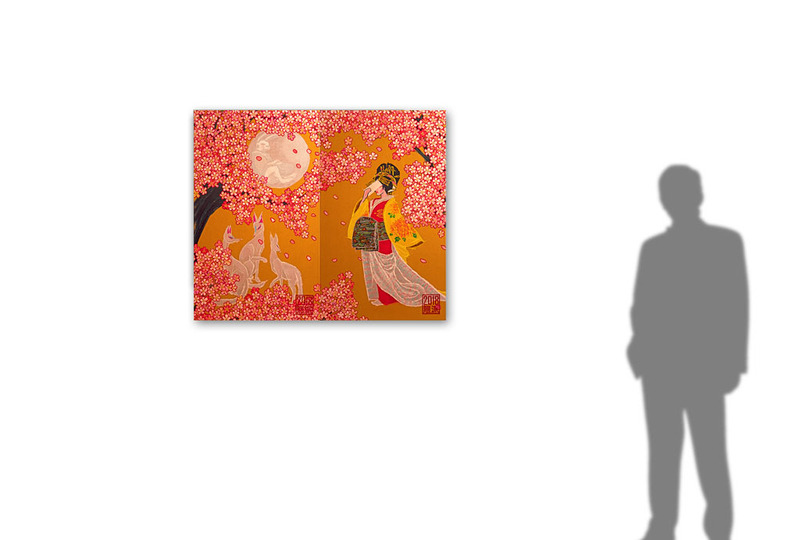 This diptych is salvaging few of those. Panel A is based on imagination and emotion. 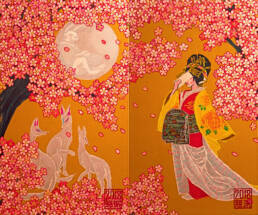 One of mythologies that I have come to really like is the one of the Moon Rabbit or the Jade Rabbit. You see in Asia there is this common belief that there is rabbit on the Moon that makes potion of eternal youth in the pestle. And as you look at the shape of the shadows on the Moon you can actually see one. This is much better than European/Western belief that the Moon is made of cheese. I have already covered this topic through Songoku and Jade Rabbit after Yoshitoshi and I feel that I will come back to it a few more times. Another part of Japanese mythology is shape shifting animals, especially foxes, which tend, like in European/Western mythology, to outsmart or trick humans. They tend to shape shift in beautiful and charming human person but I really love them in their divine animalistic form. And one of my favorite of such views is from the One Hundred Famous Views of Edo by Hiroshige – New Year’s Eve Foxfires at the Changing Tree, Oji. 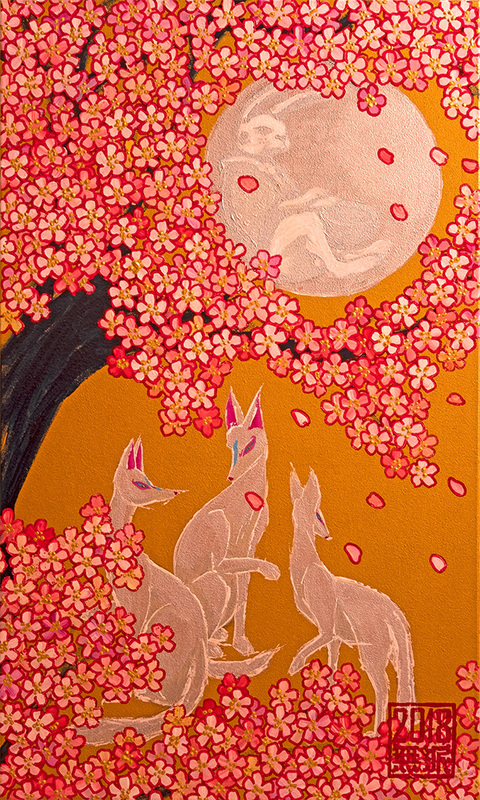 This print I have in plan of reproducing in new volume of the 100 Views of Ukiyo-e. And until then I decided to sample 3 foxes from the print for this painting. 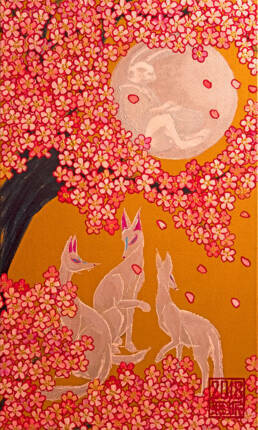 Now we have 3 foxes observing yozakura (night viewing of sakura) on moonlight, but do they also see rabbit, I wonder? As my family was lucky to experience yozakura I left small collective memory mark on the foxes. You see they bear marks of Kyubi from the YoKai Watch, an anime my kids loved while and when they returned from Tokyo. One of the most amazing experiences I had in Japan was in Nikko Edomura, a theme park of romantic version of Edo period, a real glimpse of Edo of Akira Kurosawa´s samurai movies. Apart from being theme park, it is also used as a movie set. If you like samurai, ninja and other romanticized part of Japanese culture, this is definitely place to spend your day at. And Nikko region of Tochigi is beautiful mountain tops region, with plenty of history, wonderful nature and much cooler climate, so it is excellent destination to run to from Tokyo´s humidity. 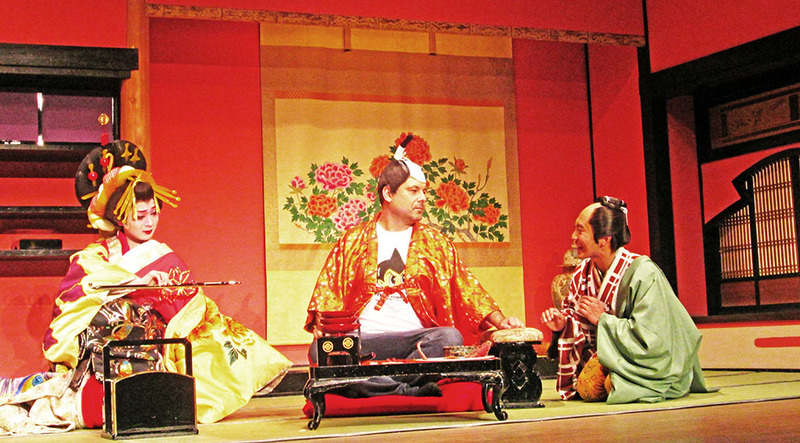 I was invited to the stage in Nikko Edomura to play a role of daimyo in “Wakamatsu-ya” (oiran´s tale) where oiran seduces daimyo in the golden room. 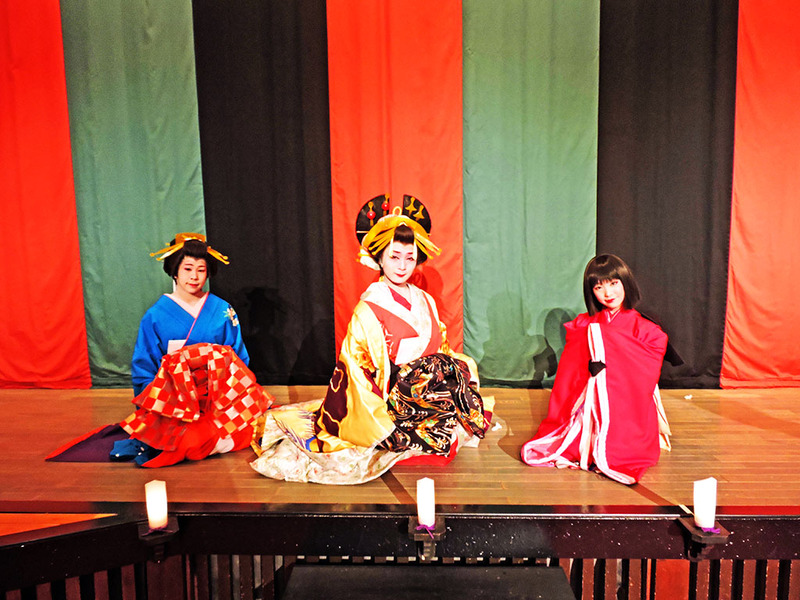 Now in Edo period oiran was high class courtesan, a castle wrecker, her skills in entertainment and her beauty could drain an aristocrat of his fortune. They were worshiped as trend setters, admired in time of hanami and depicted by many ukiyo-e artists in their bijin-ga scenes, like famous oiran Hanaogi. I wanted to do something similar, a new ukiyo-e, an entrance of oiran in the golden room, with covered face, a seducing iki moment. There are plenty more memories from Nikko Edomura, like Oiran Procession, or my kids having samurai duel, and many more, I hope they will all find a way to be recorded on canvas. Fragmented and segmented, distorted and unique, memory of a human is nonlinear story tale and only through arts it can be partially transferred, observed and re-experienced. 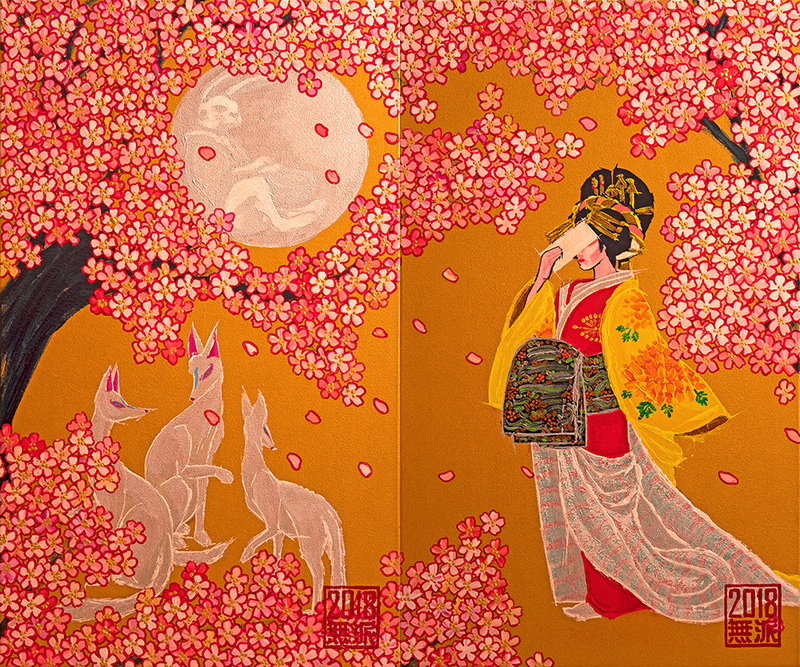 So what´s the story here- is oiran a fox seducing a rabbit, or does she hide herself from the moon shine that could reveal here true form? I don´t know, I guess it is up to you to read this painting as you seem fit, to read/write these fragments of me into new story for you.